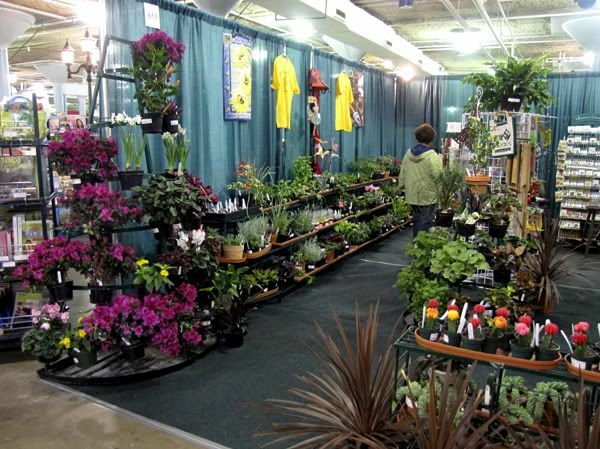 For us - meaning Mom and me - the Ft. Wayne Home & Garden Show is the kick-off for the gardening season. No, we can't go home from it and run right out and start digging in the dirt, but we start really planning for the not-far-away days when we can. 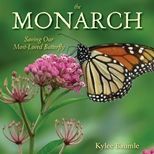 Seeds are bought, maybe some bulbs, and we get to see some perennials up close that we might want to get for our gardens. 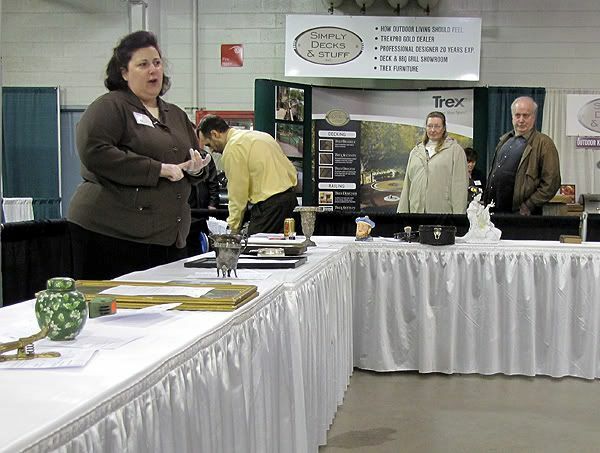 We arrived at the Memorial Coliseum a few minutes before the doors opened to the general public, but since we were both members of the AHS, we got to enter through the exhibitors' door - early even! 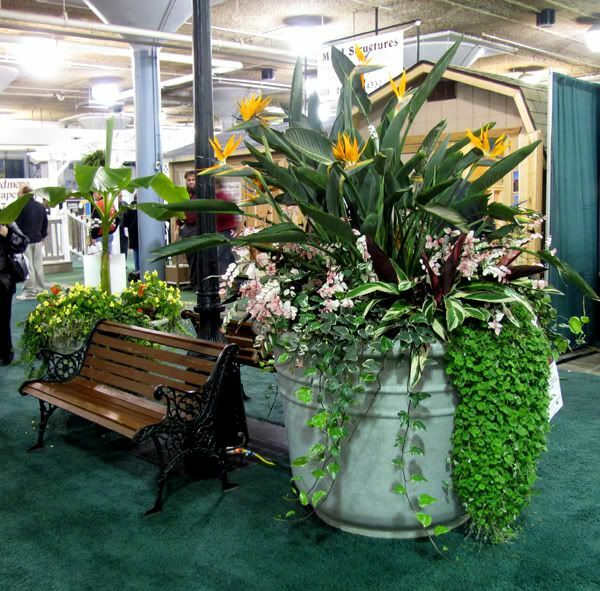 The usual hallway of spring blooms greeted us as we made our way into the garden expo hall. ...but we made a beeline for the rear of the hall, where Dr. Lori was going to be speaking at noon. Dr. Lori is a certified fine art and antiques appraiser, an award-winning TV personality and TV talk show host, and a nationally syndicated columnist. Today, she was offering one free antique appraisal and I'd brought one of the books in my Winnie-the-Pooh collection - a 1946 French edition. What makes my French Pooh book unique, besides being a relatively rare item, is that I believed it to be signed by A.A. Milne. The inscription didn't contain "A.A. Milne," rather it was signed, "For Vi, From blue," with the familiar fluorish under the name. 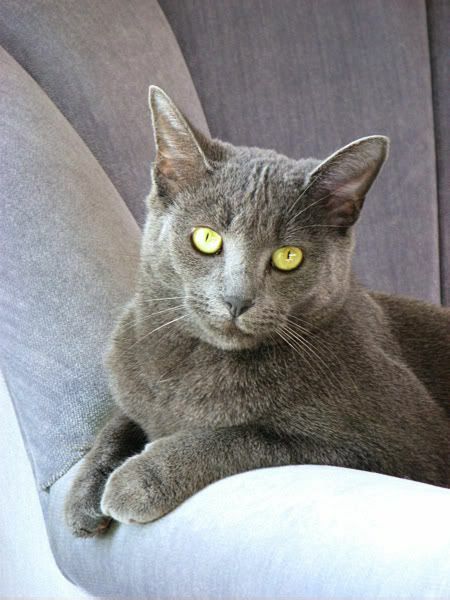 But I knew that Milne was known to his friends and family as "Blue." My turn came and Dr. Lori asked me how I acquired the book (online from a used book store in France) and what I'd paid for it. She explained that it was a relatively rare item, in good condition (though it had some acid burn on the dust jacket), and confirmed that it was indeed signed by Milne. When all was said and done, her appraisal was over 300 times what I'd paid for it. I was a happy girl! No plans to sell it just now, though. Now that that was out of the way, we proceeded to check out the various gardening displays and exhibits. 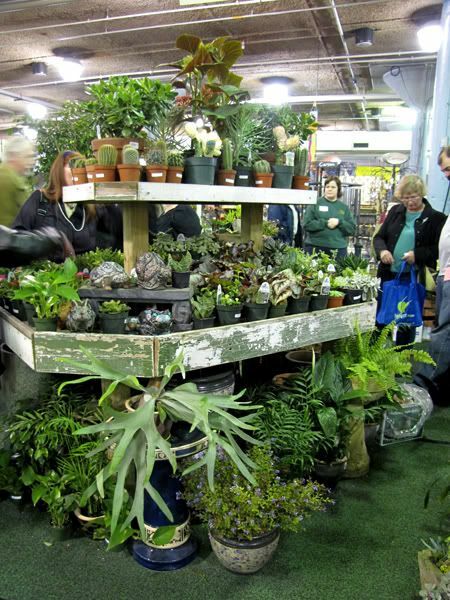 I always love to visit the Foellinger-Freimann Botanical Conservatory booth, because they bring so many wonderful plants from their greenhouse, with extremely reasonable prices on them. 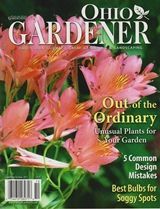 This year was no exception, and though my intention upon attending this year's show was to just look and not buy, I was a goner when I saw the variegated Bougainvillea in bloom and the variegated Jade plant. Sold. Both of them! 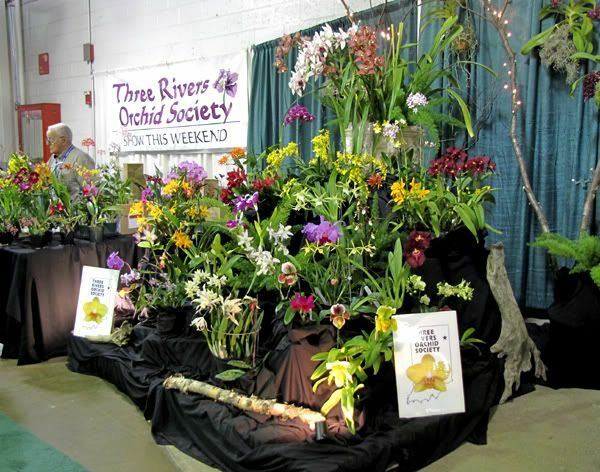 The next favorite spot for me is the Three Rivers Orchid Society booth. 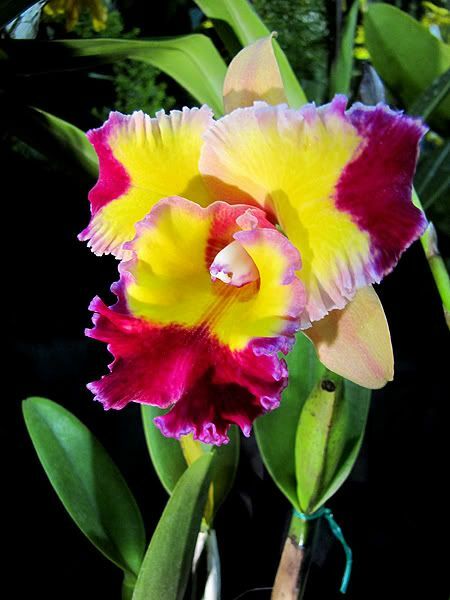 Ohhhh, such loveliness and fragrance all in one spot! 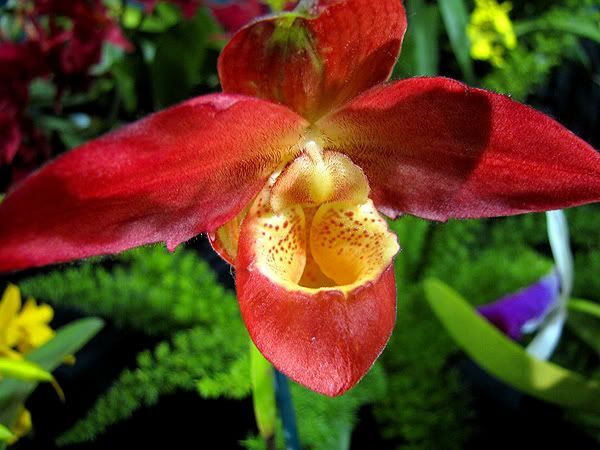 There were several beautiful orchids for sale, but I settled for taking some pictures of some of my favorites. 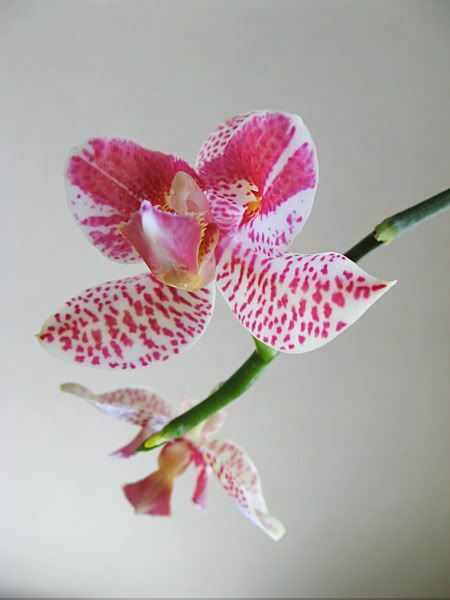 I spoke with one of the members regarding the lack of rebloom of a couple of my orchids, and she provided some advice (repot and move to a new location). 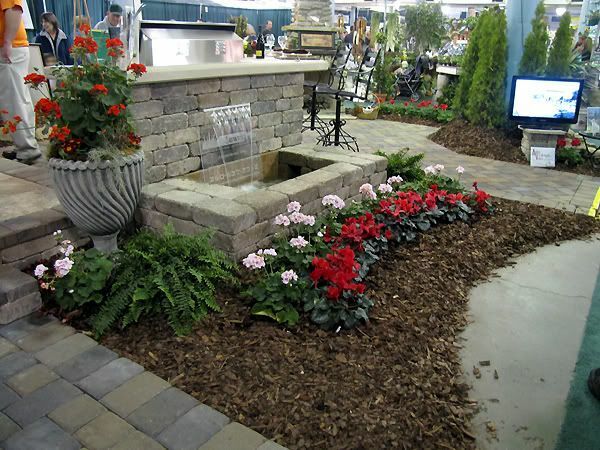 I don't know if it's because this is my third year in a row attending the show, but I was underwhelmed by the landscaping displays. 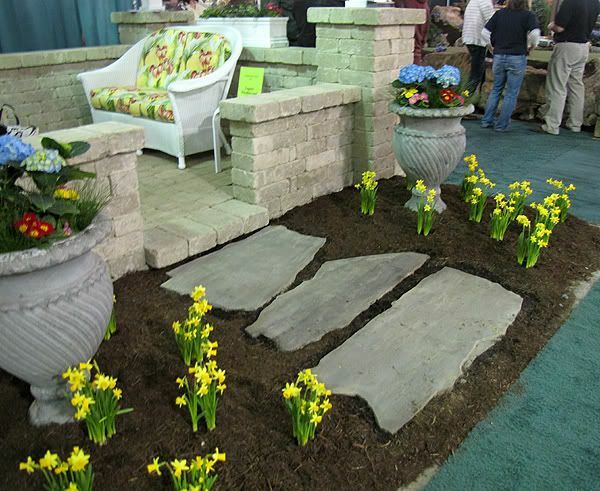 There wasn't much new in the way of design or hardscape and the lack of actual plantings didn't help. 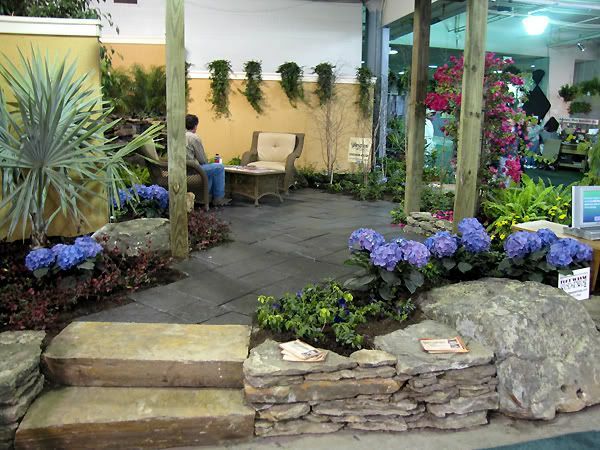 I did like the use of large flat rocks for walkways, in comparison to the use of smaller ones so commonly seen. 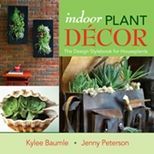 In the aisles between displays were several extremely large stone or clay pots heavily planted and situated with park benches. These were quite attractive and lots of positive comments were overheard as we passed by them. 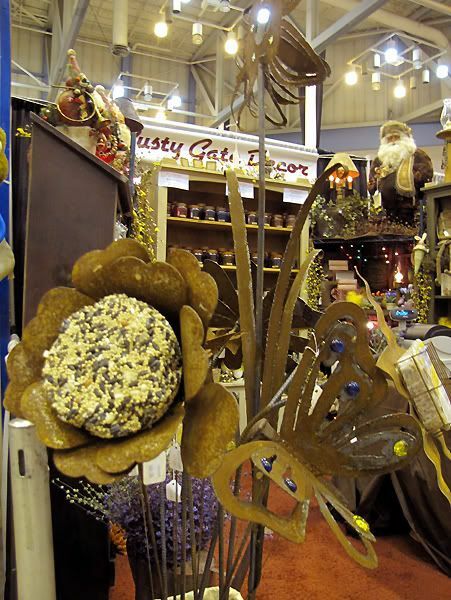 We paid a visit to the booths of local garden centers and nurseries, several of which were familiar to us from previous shows. Lots of wonderful offerings were there for the buying, but I resisted since I'd already purchased two more plants than I'd intended. Succulents of all kinds seemed to be in abundance and I wondered if it was a reflection of the hot, dry summers we've had in recent years. 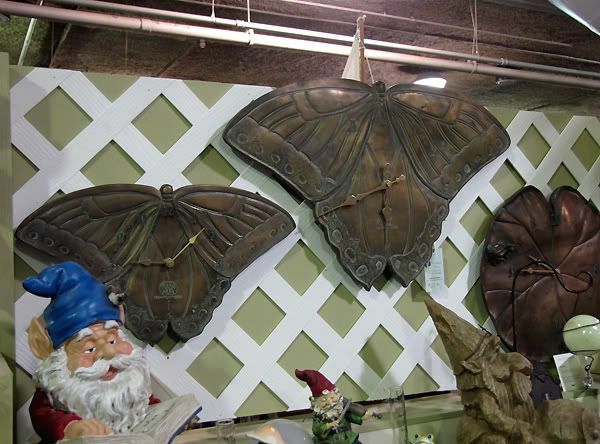 There were several booths by businesses that didn't have plants to sell, but plenty of garden decor and whimsy. 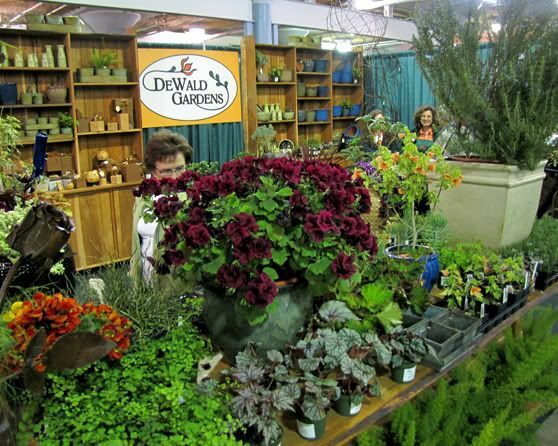 One of my favorite displays was by DeWald Gardens, new to the show this year. 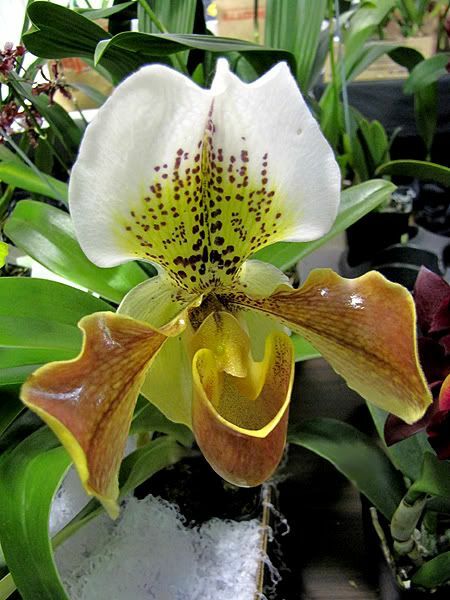 DeWald Gardens is the first greenhouse in Indiana and one of only four nationwide to receive the distinction of "Up and Coming Greenhouse Business for 2008" . 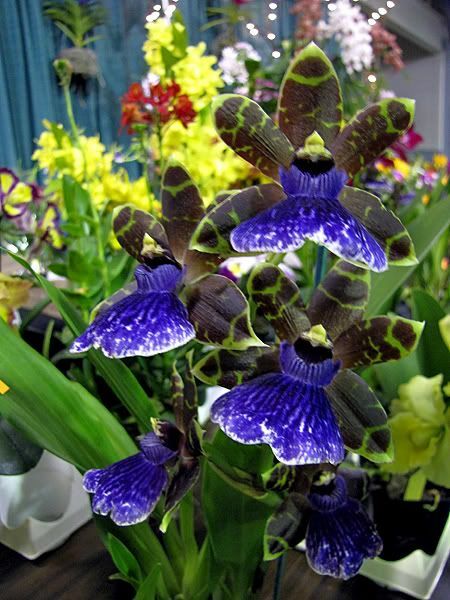 Steve and Maria DeWald both have had successful careers as plant research scientists and have Ph.Ds in horticulture. Maria, who was born in Italy and lived in Venezuela (her accent is charming! 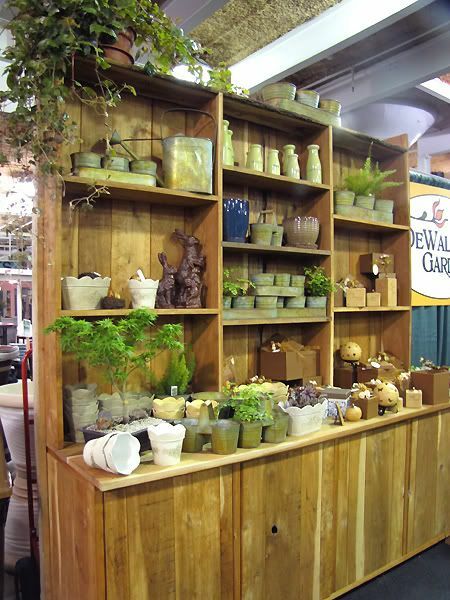 ), has had her container designs featured in several gardening magazines. Their display showed a lot of class and I loved the pottery. 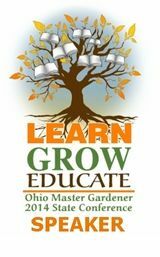 There were beautifully planted containers, several healthy coleus cultivars (one of their specialties), and a gorgeous Japanese Maple bonsai for sale. I had a delightful conversation with the owner and plan to visit them in the coming months. 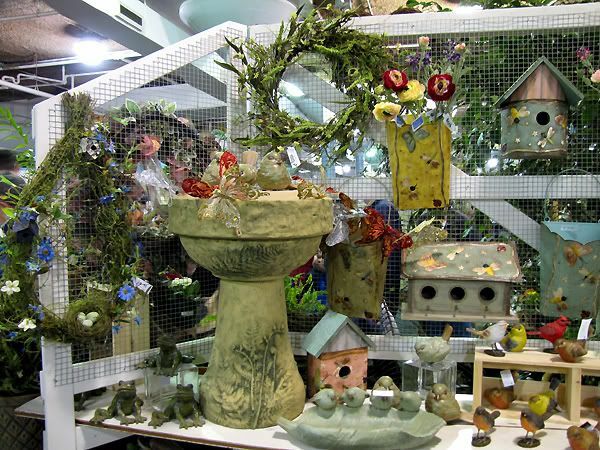 We left the garden expo hall and walked over to the home section of the show. 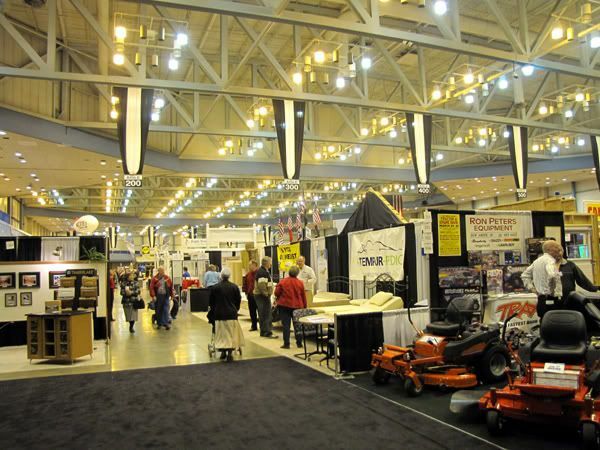 Here was where you could see exhibits for home improvement, lawn equipment, cooking equipment, and various other related businesses. There were plenty of food items for sale and sample as well. One of the more unusual booths was by River City Links, which is an 18-hole putting course in Ft. Wayne. It is a well-known fact that I am the black sheep of a golfing family, due to my lack of ability to cause a driver to make contact with a teeny tiny white ball, no matter how hard I concentrate on keeping my head down. Both of our girls played on their college golf teams and went to state with their high school golf team, no thanks to my genes. However, I can putt. Go figure. River City Links gave the opportunity to make a hole-in-one for a free round of golf. Mom and I both managed to do it, so guess what we will be doing this summer? 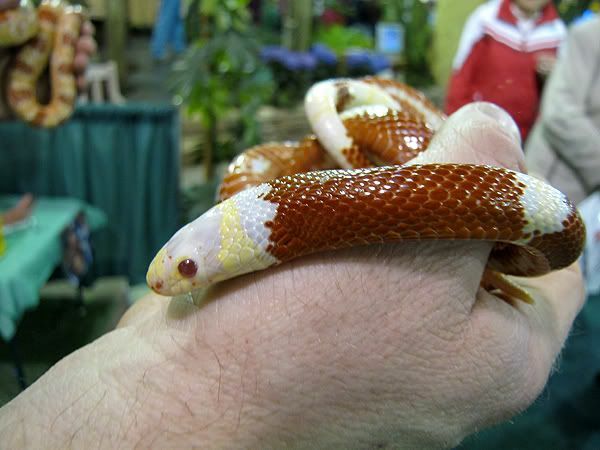 I'm not sure why home and garden shows feature exotic pets, but it's not the first time we've seen this. At the Indianapolis show Mom and I attended last year, there were sugar gliders. Today's show in Ft. Wayne had snakes. Now I happen to think snakes are cool, but not everyone shares my enthusiasm, so I've kept the photo of the milk and corn snakes to the right at thumbnail size. If you would like to see it in all its glorious, scaly beauty, just click on it. 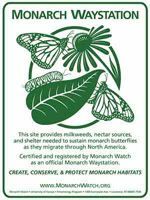 I still had a few dollars burning a hole in my pocket, so I purchased a couple of packets of seeds from Renee's Garden (sold by the Conservatory): Cerinthe 'Pride of Gibralter' (Cerinthe major atropurpurea) and Butterfly Monarda 'Bergamo Bouquet' (Monarda hybrida). Both are annuals here. 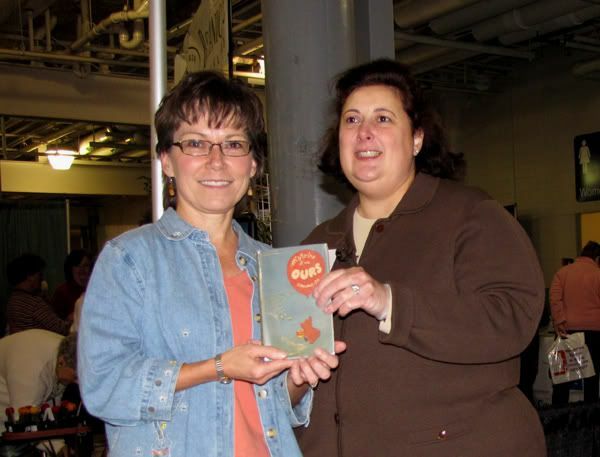 The Allen County Public Library was giving away free packets of French Dwarf Marigold seeds at the Master Gardener's booth, so we picked up one of those, too. 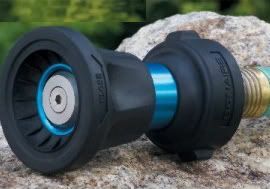 Mom and I both purchased new hose nozzles, invented by a fireman, and guaranteed for life and guaranteed not to leak. If they'd been cheaper (we paid $25 each), I would have bought three of them instead of just one, but one of the nice features is the washer is integrated so no worries about losing it when switching it from one hose to another. 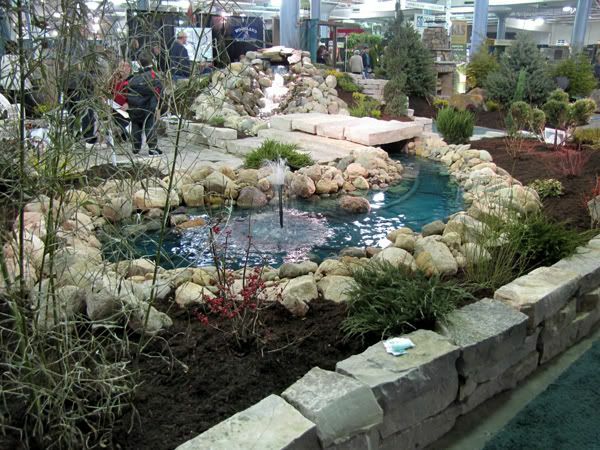 One of the fun things about going to a local home and garden show such as this is that you run into people that you haven't seen in awhile. Both of us saw several friends and acquaintances and stopped to chat for a little bit before moving on. We left the show buoyed by the goodness of it all and with a lighter heart, in spite of the cold wind that greeted us as we went out the door. Witch hazel (Hamamelis x intermedia ‘Pallida’) in full bloom at the show, courtesy of Blue River Nursery. I'm sitting here grinning, and it's such a simple thing that's making me do it. The outdoor thermometer reads 54° F. This makes me happy, not only because 54° is particularly warm, but because it means the weather is starting to actually act spring-like, even if it officially doesn't arrive for a few weeks yet. 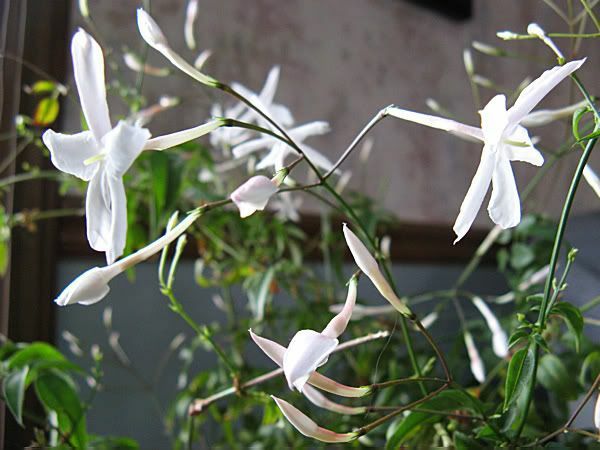 This begins an up and down cycle of temperatures which, along with increasing hours of daylight, helps to signal the gardens that it's time to wake up from their long winter's nap. It makes me more energetic, too. My calendar is beginning to actually have things on it. Today I had lunch with a friend, and tomorrow Mom and I are going to attend the Ft. Wayne Home & Garden Show. 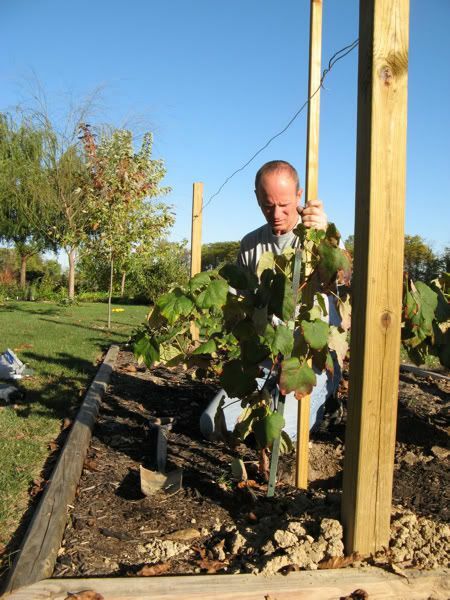 Warmer temperatures also bring to mind those projects that need to be done and first on the list here at Our Little Acre will be to finish the grape arbor. I mentioned last year that I wanted to grow some grapes, and while harvesting them will be wonderful, I really wanted to grow them for the beauty of their vines. 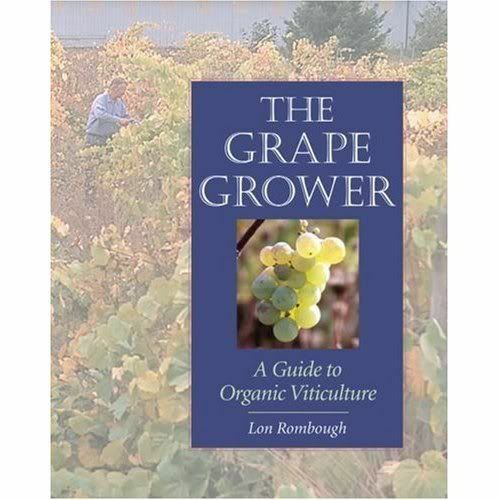 The first thing we did was consult our grape bible - The Grape Grower: A Guide to Organic Viticulture by Lon Rombaugh. This is undoubtedly the most complete and informative book that's out there on the subject of grapes. In April, we planted eight vines of table grapes: 2 Himrod (white seedless), 4 Reliance (red seedless), and 2 Mars (blue seedless). They were planted in short rows from east to west, to allow for air circulation, since our prevailing winds come from the west. 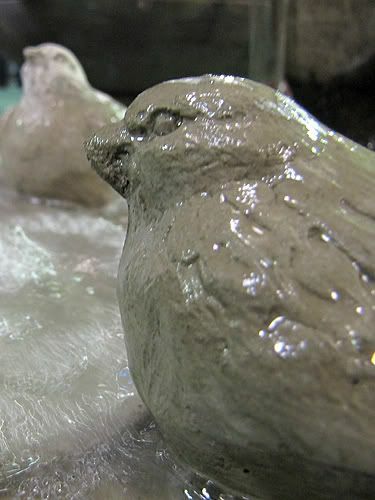 They were small and took awhile before they started to take off, but all except one Reliance did well. 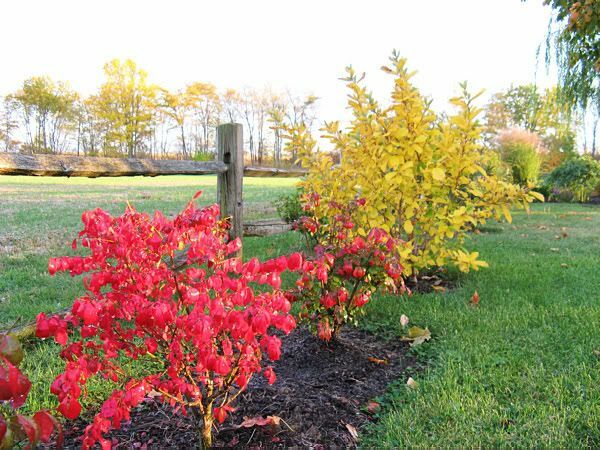 I moved the opposing Reliance vine and replanted it next to a section of the split-rail fencing on one border of our property. Then I replanted the other Reliance vines so they were equidistant from the others, which was probably a better situation anyway, since I'd placed them a bit too close initially. I wanted there to be a distinct area for the grapes, so we used landscaping timbers to delineate the area and I killed the grass inside by placing layers of newspaper over it. Next, I put a layer of mulch over the newspaper and that was that. 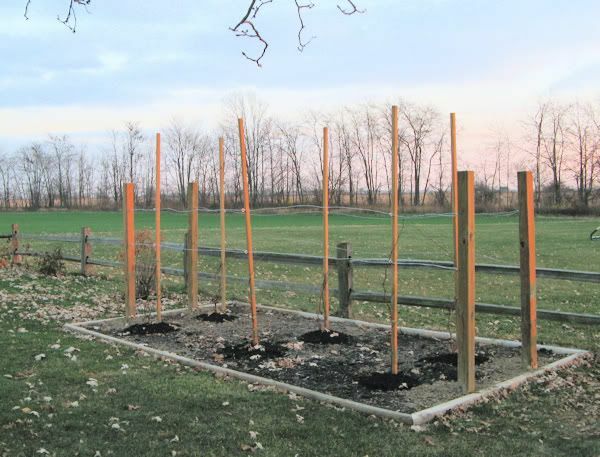 While we weren't quite sure how we wanted to do the trellis system, we began by just letting the vines grow and staking them to a short post. They grew this way until fall, when we knew they were large enough that we needed to get the more permanent system installed. 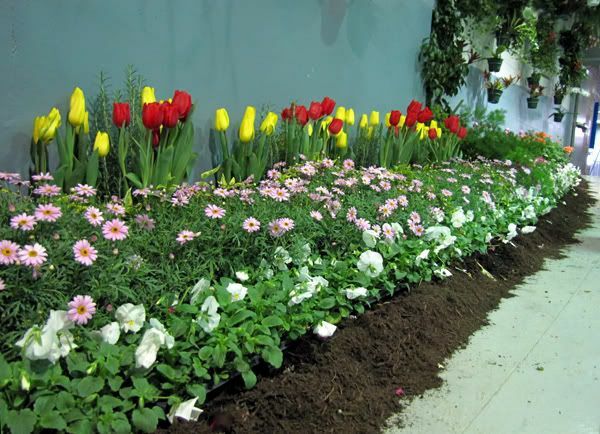 Otherwise, winter winds would whip them around, so with more sturdy support and staking, they'd be ready to go once spring arrived. We adapted information found in The Grape Grower to our needs and Romie began by digging holes for the 4x4s that we used for end posts. 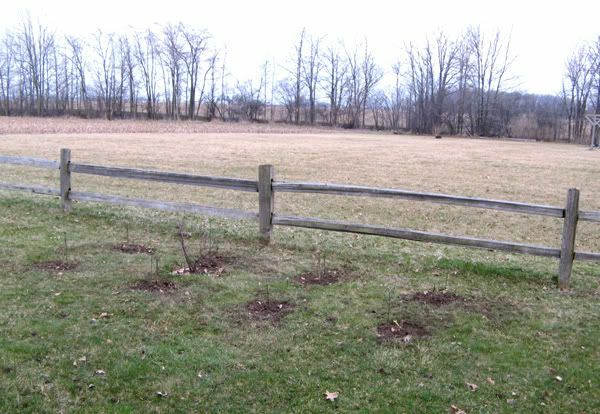 Next, holes were dug for the 2x2 wood posts which would go next to the grape vines. Here is where we would have been much better off to have placed the posts first, but Romie was very careful not to cut any of the roots he encountered. Eye bolts were put at the proper heights on all the posts. 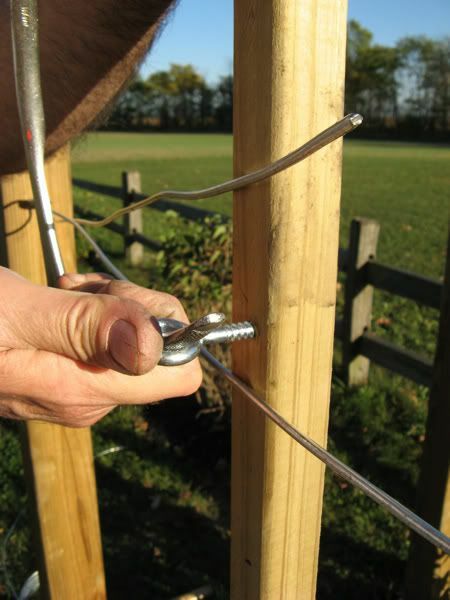 We strung heavy-gauge wire from the end posts, threading it through the eye bolts on the smaller posts in between. The grape vines were semi-pruned of their lowest auxiliary shoots, leaving one large stem for the trunk. One of them has two strong stems, so we left them both until we figure out what to do with that one. The vines were then well-secured to the supports with Velcro® plant tape. Now spring is coming and we need to finish what we started. Plans are to get four more 4x4s, which will go in between the middle vines and the end vines. Then a pergola-type covering will be constructed over the entire structure. It won't be tall enough to walk under, but will provide aesthetic interest and further support for the vines as well as keeping the end posts from collapsing inward. I also need to read up on how to prune the vines. I don't expect to get any grapes yet this year, but I do expect that the vines will grow quite a bit. I have been whining and lamenting all over the blogosphere about my lack of witch hazel blooms. 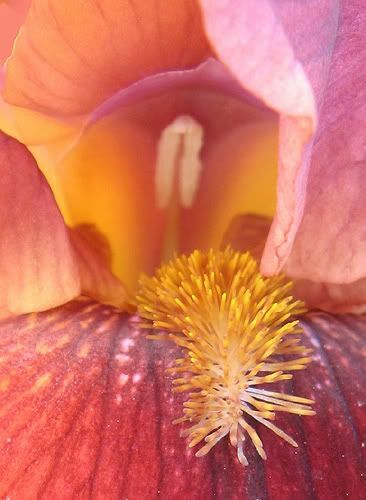 Time after time, I see yellows, reds, oranges, and even yellow AND orange together in beautiful photos on other blogs. Some are in the same zone I am, so why don't I have blooms? 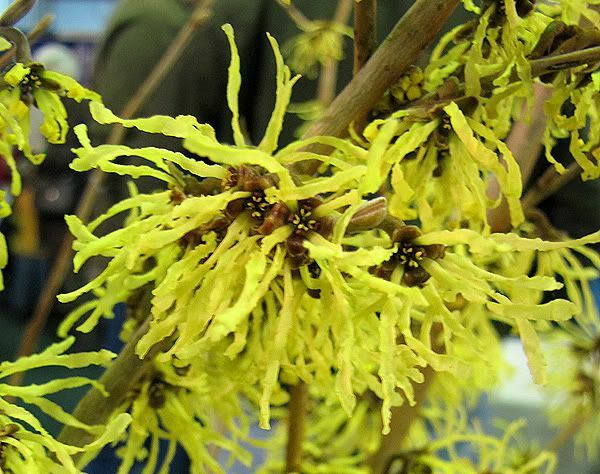 I bought a witch hazel last summer and though I really wanted a Hamamelis x intermedia 'Diane' or 'Jelena' (any of the redder ones), I couldn't find them and settled for a common yellow one (Hamamelis vernalis). It was nicely shaped and a bargain I couldn't pass up. It was beautiful last fall when its leaves turned a gorgeous golden yellow color and I looked forward to seeing winter blooms. Witch hazel is completely new to me - mine is the very first one I've ever seen in person. Can you believe that? They're even native here! When I started seeing blooming witch hazel photos popping up on other blogs about a month ago, I made the cold trek out to the back of the property and inspected ours. Nope. No sign of blooms. 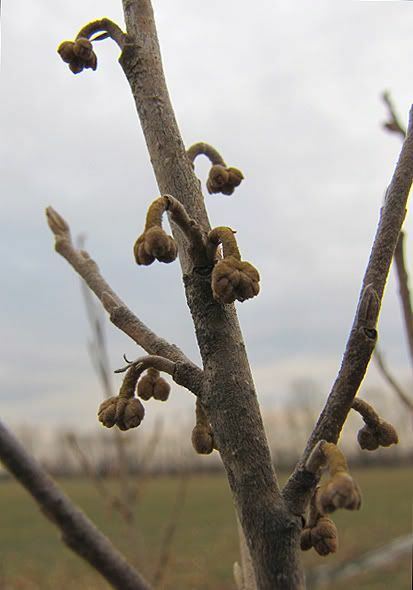 There were several larger brown things attached to a few branches, which appeared to be shells of previous blooms, but nothing except teeny tiny round leaf buds all over the shrub. Today was a gorgeous late winter day. No sun, but the temperature reached 55° and snow was melting fast. The ground even had a little "squish" to it when you walked on it. I took a look around the yard and in the gardens and was happy to see swollen buds on all the lilacs and the new viburnum that I thought I'd killed by letting it get too dry after planting last fall had buds on it, too. I thought I might as well have another look at the witch hazel, and hmmmm... It looked a bit different than it did before. 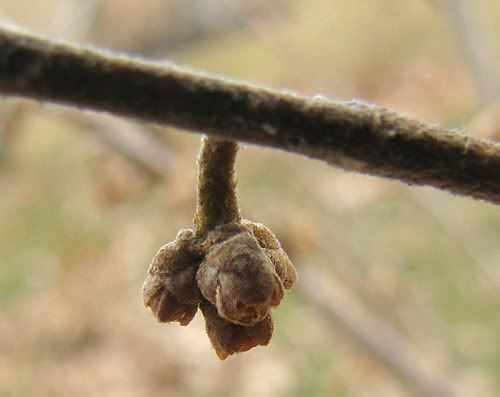 I saw leaf buds on the ends of the branches - some even looked like they were actually leafing out - but those clusters of little round balls hanging all over it were much bigger than the last time I checked. Could they be flower buds? 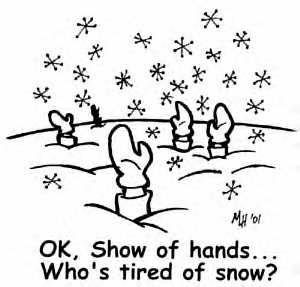 Though there are many of us that are indeed tired of snow in particular and winter in general, this post is dedicated to Jodi of bloomingwriter, who seems to have borne the brunt of winter's fury more than most. 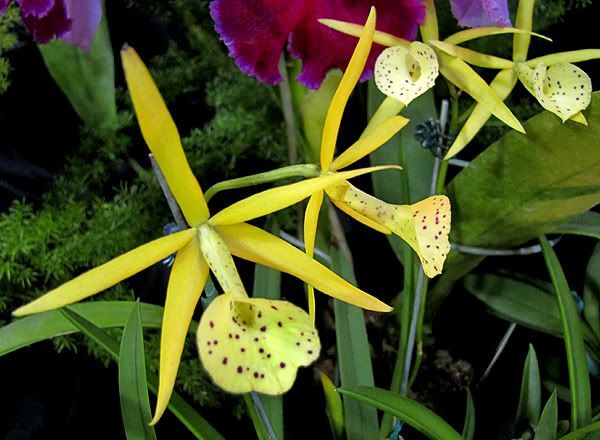 Jodi, here's wishing you warm suns and gentle breezes as spring finds its way to you. Eventually. Someday. Soon. Cats are sneaky. No great revelation there. There are wheels constantly turning in their little triangular heads and if we could just decipher what goes on in there, I feel certain we'd have a cure for cancer, world peace, and people in Florida could grow tulips. You think dogs are smart? Cats are smarter. I'm pretty sure that they can do anything a dog can do - except bark - it's just that they don't want to. That would be giving in and they're far too independent to waste their time doing what you want them to. I have managed to train Baby to come when called though. We cater to our kitties just a little bit. Romie is much more accommodating to them than I am though. (Perhaps that's why Simon likes him better than me.) We have a kitty dish in the kitchen, which is kept full of fresh drinking water for them, so they don't have to go down to the basement, where their main food and water (and litter box) are located. But this dish had become somewhat of an annoyance. Oh, the dish is cute enough. It's got a cat's face on it, whiskers and all. 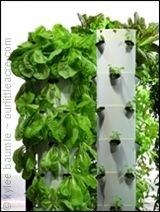 It holds just the right amount of water to keep them supplied during the day. That is, if someone (not naming names, but a black and white bundle of fur was observed running from the scene) doesn't keep tipping the bowl over. I don't really enjoy walking into the kitchen in my stocking feet and stepping into a puddle of water. 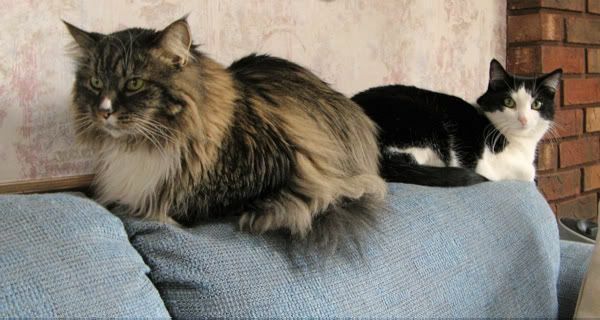 We didn't know which of the kitties was the culprit, but we narrowed it down to two. 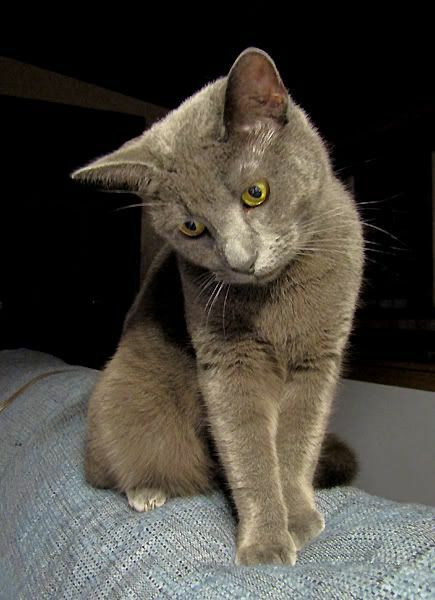 This started happening before Jilly, our Russian Blue wannabe, was allowed to stay in the house all winter, so it was either Simon or Baby. Like a good detective, I kept my eyes and ears open for clues that the crime was being committed. I watched as each of them walked into the kitchen, hiding behind the cupboards so my spying self would not be detected. First Simon...no, it wasn't him. Then Baby...no, she didn't do it either. Both just lingered for a short sip then went on their way. Then I heard the telltale sound of a bowl scraping across the floor. Romie was at work, so I knew it wasn't him puttering around in the kitchen. 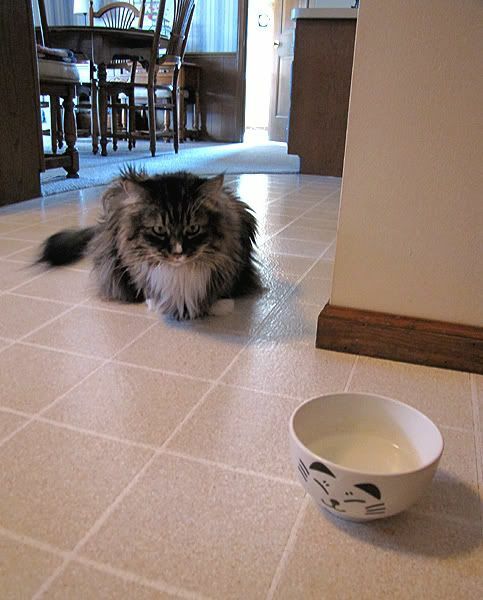 I tiptoed out, just in time to see Baby with her paw in the bowl, pulling it towards her, spilling the water. BUSTED! This went on for months and simply knowing who was doing this didn't help at all. I could talk to Baby until I was blue in the face and she continued to spill the water. There's that independence thing I was talking about. The simple solution would be to remove the bowl, wouldn't it? But that would be mean and there must be a simpler solution. A few weeks ago, I was shopping with my mom in Steinmart and found a lovely iron food and water dish holder with nice stainless steel dishes. 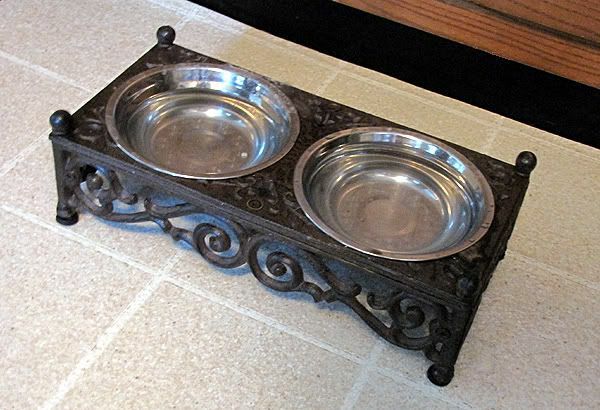 The dishes were held at a level of a few inches off the floor and while I thought it was pretty, the first thought that came to my mind was that this would solve our spilled water dish dilemma. I brought it home, washed the dishes, and filled them both with water. 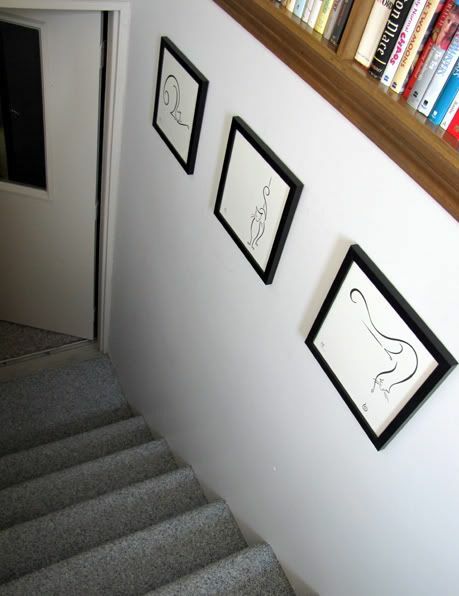 (No food, because gosh darn it, they have to get a little exercise going up and down the stairs to the basement. Our cats are fat enough already.) The cute little white kitty dish was put in the cupboard and I rejoiced in knowing I'd never again have soggy socks. Here we go again. I stepped in a puddle, looked into the water dishes, and noticed that one was completely empty. NOW who? And how? No one is fessing up to it, but I have some theories as to both who and how. As I mentioned earlier, Jilly somehow charmed us into letting her stay in the house all winter. For the most part, she's been fairly well-behaved. Very little claw-sharpening (which is actually a territory-marking trait) and she gets along well with both Baby and Simon. Most of the time. She's quite vocal, which we love, unless it's 4:00 in the morning and she decides there is an issue she just has to discuss right away. She won't be denied and after having our faces walked over numerous times and listening to her plead her case, one of us has to put her outside the bedroom door and close it. Another five minutes of beating a dead horse, and she gives up. Yeah, we love her. So now, there are three suspects. I don't think it's Simon, because he actually prefers to get his water from the bathroom sink. He's gotten so big that it's difficult for him to jump up there on his own, so he stands by the sink cupboard until one of us lifts him up. 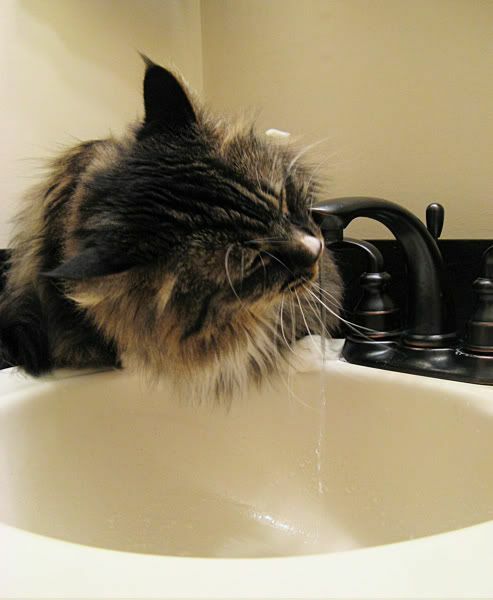 He and I have a ritual, whereby he knows he has to give me a "kiss" before I'll turn the water on. Simon's kisses are a lick on the chin and he always obliges. Romie just gives him what he wants straight away. It could be Baby. Since she seems to get a kick out of spilling the old water dish, perhaps she has learned a way to tip the new dish out of the holder. But because of something I've seen before, I have a feeling it's not Baby, but Jilly. 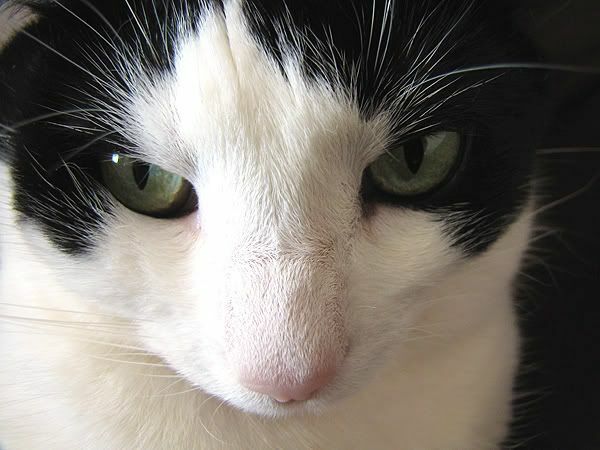 Cats can do strange things, which is part of what endears them to their owners. You just never know what quirky behavior will erupt from them at any given moment. Jilly is no exception. When Jilly drinks water from a dish, she assumes a peculiar stance. She sits, balances on one front paw and tucks the other front one all the way under her, keeping it elevated from the floor the entire time. She always does it. It's kind of like on Everybody Loves Raymond, where Robert has to touch his chin with the spoon first when he takes a bite of food. Just one of those things. 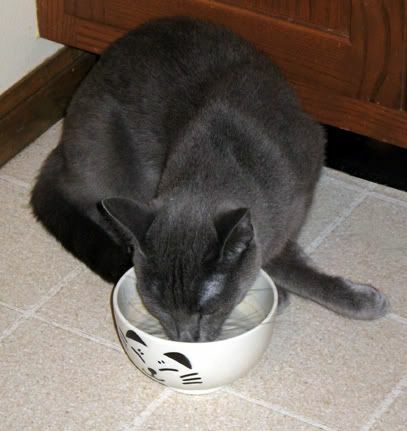 Now just suppose that Jilly were to drink from the dish, and she were to accidentally lift the water dish with that wayward paw just enough to spill some water? I've not actually seen her do it, but it could happen. I'll keep working on the case, but I might have to enlist the help of Secret Agent 007.5, otherwise known as Harley. At least he speaks the same language as Jilly. Perhaps he has ways to make her talk. On the other hand, Jilly probably knows how to use her feminine wiles to get Harley to keep a secret. There's still snow on the ground, outside my window. Bleah. The sun is shining though, and while it won't warm us enough to melt the snow, it's better than the usual gloomy gray skies of winter. And we're on the downside, with just 25 days until the calendar says it's spring. In the meantime, I'm reminded of why I grow house plants. 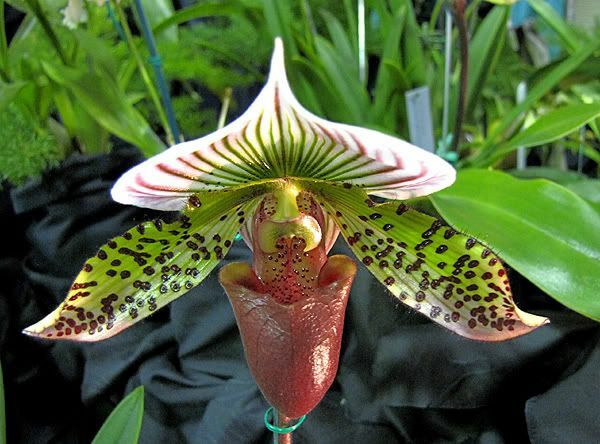 There are several of them in bloom at the moment and their beautiful faces are not lost on me. 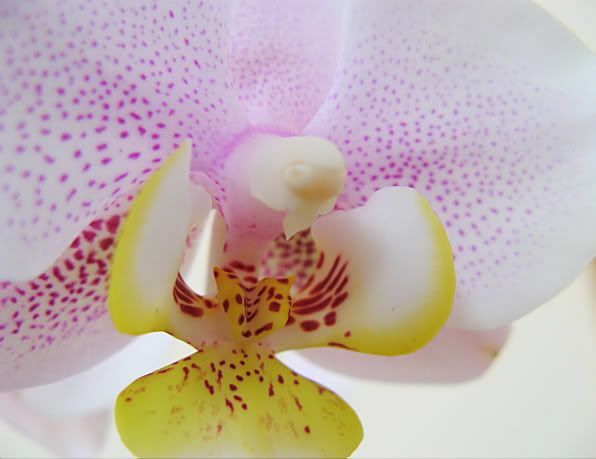 As regular readers of this blog know, I love to study the intricacies of a flower blossom up close and personal. I'm continually amazed at the detail with which God fashions each one. The fuzzy beard acts as a runway, leading the potential pollinator into the reproductive organs of the plant. 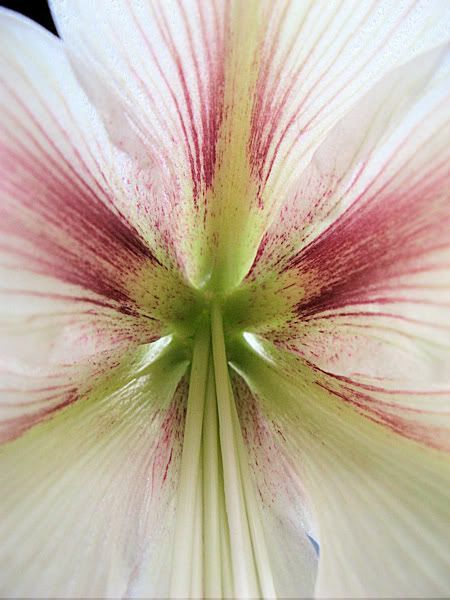 In addition, the hairs serve to brush off pollen that may already be on the pollinator's body as it enters, helping to insure pollination of the flower. And you thought it was just another pretty face! 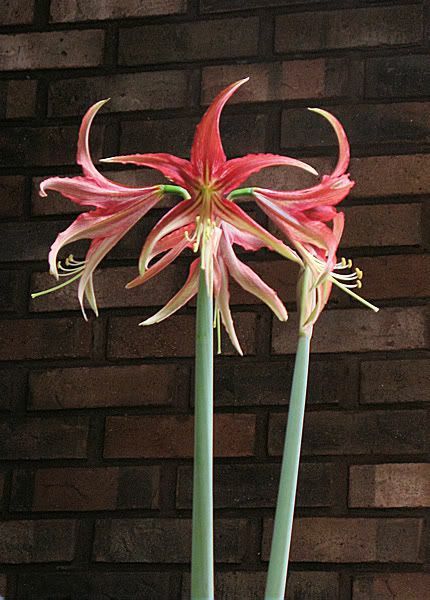 I purchased this plant about three years ago at the Foellinger-Freimann Botanical Conservatory in Ft. Wayne for four dollars. About a year ago, I was ready to pitch it into the compost bin, mostly because I'd neglected it and it was on its last leg. 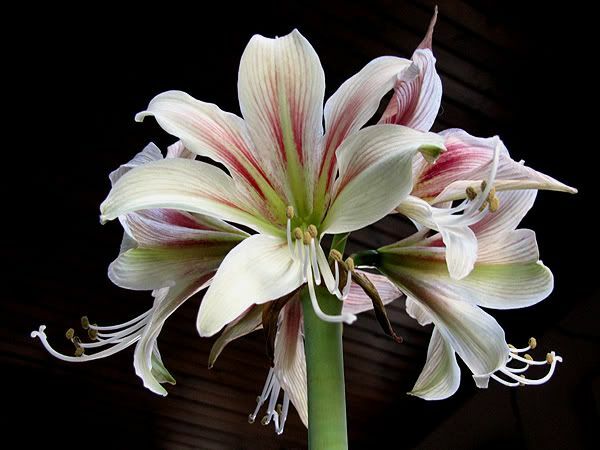 Then it all of a sudden decided it was going to show me a thing or two, and it has come back quite nicely, even rewarding me with blooms. 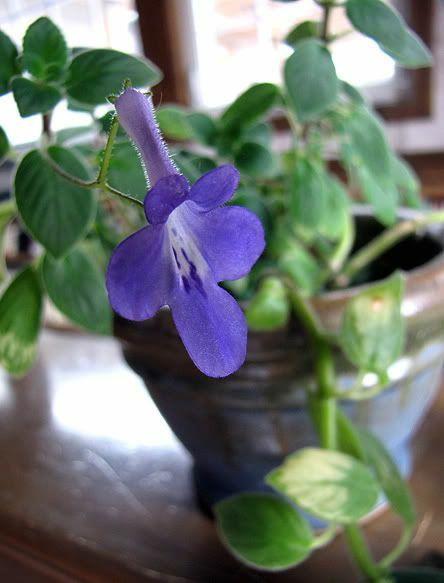 Some references list Streptocarpella as a selection of Streptocarpus, but these two groups of plants are considerably different. 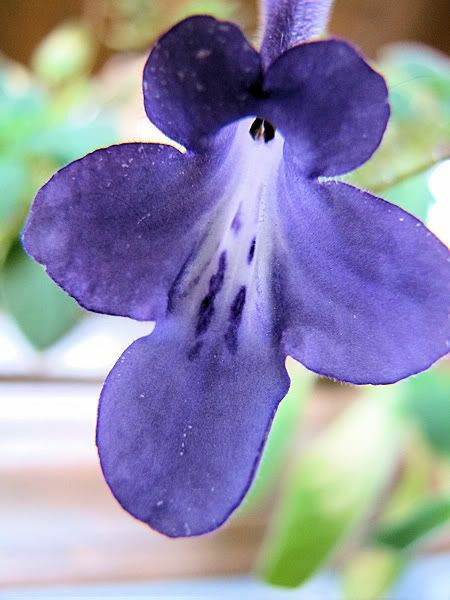 While the flowers of Streptocarpus and Streptocarpella are similar, the plant habit is considerably different. 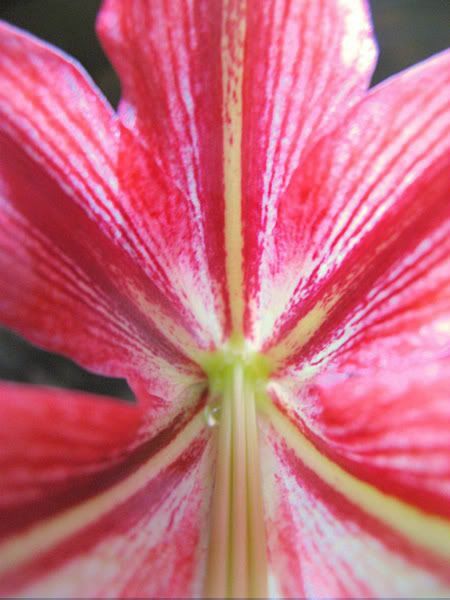 Streptocarpus grows in a basal whorl of leaves with no above-ground branching while Streptocarpella has a well branched top. 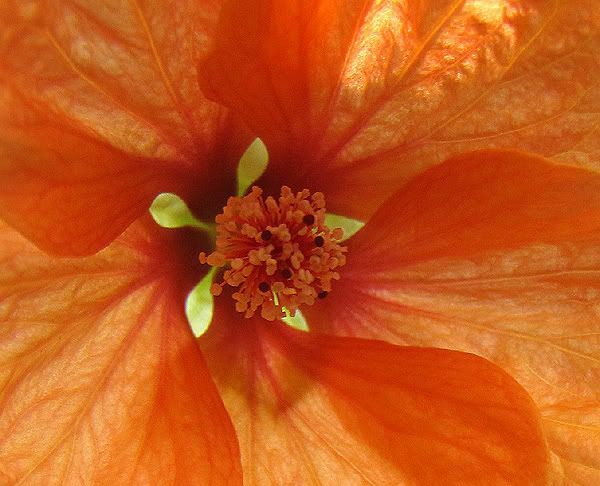 The Flowering Maples are all in various stages of bloom, with this Abutilon pictum 'Thompsonii' being the star of the show. The speckling in the leaves is caused (on purpose) by the mosaic virus. 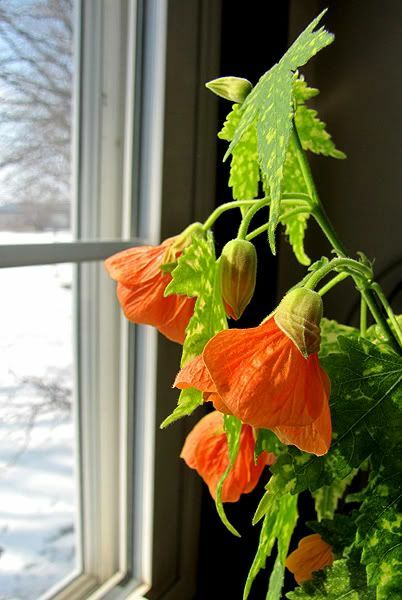 The virus can be spread to other abutilons by way of insects, especially white fly, or by grafting. So far, this one remains the only one with speckles here. 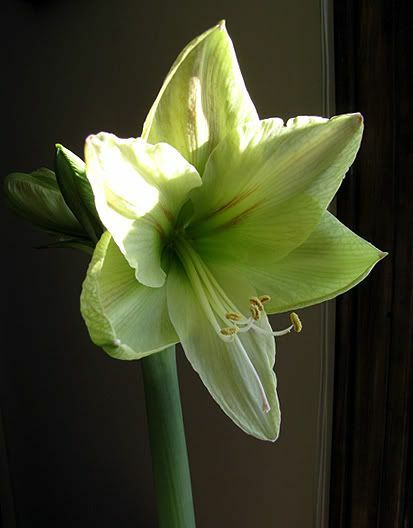 This is either 'Lemon Lime,' 'Limona', or 'Green Goddess.' My labels got mixed up and I thought I'd be able to tell which was which when they bloomed, but I can't. 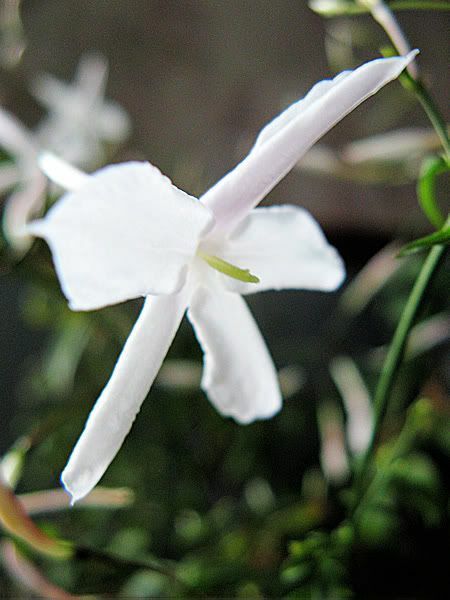 I'm not sure which jasmine this is, because it was simply labeled "Jasmine" when I purchased it a couple of years ago at a garden center in Cleveland, but it has provided the house with a wonderfully tropical scent. These two photos were taken about a month ago and it's pretty well done blooming for now, but there are more buds coming on. 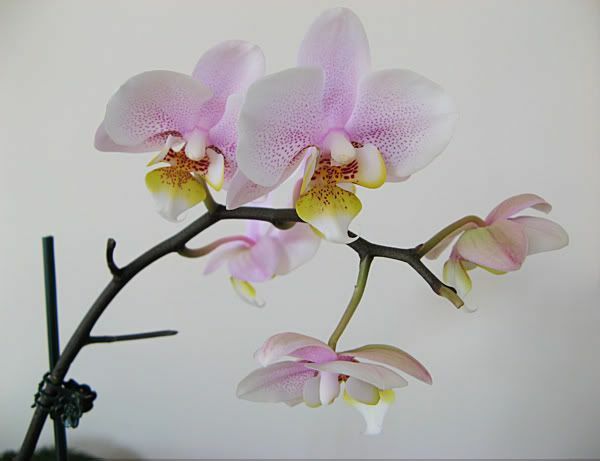 Two of the orchids are still nicely in bloom, with another one forming buds on its flower spike.